Thank goodness it’s Friday! It’s been a crazy week, and I’m actually grateful to have two days off without agility. Hopefully I’ll be able to recover going into the Thanksgiving holiday, which I’m sure will amp up the stress again. First, the good news. Ticket is in the home stretch. Next Tuesday she gets her 8 week xrays to assess bone healing. If everything looks good, then crate FREEDOM! And we’ll get to start reacquainting her with agility. We will both be happy that day. I also filled out January entries for her today–so excited to run my crazy blue girl again! I xrayed Mardi on Monday, and her stomach was still full, so I decided to go ahead and open her up. Glad I did. Her stomach was FILLED with kohlrabi, a nasty vegetable that Ryan grew in our garden. They are very large, and she ate two of them. I think she could have passed a little, but not this huge volume. 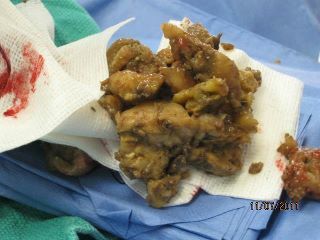 I got all of that out of her stomach, and also went into her intestine in two places to remove a couple of large pieces. I couldn’t advanced them forward, and I was afraid they would cause an obstruction, so I went ahead and took them out as well. We are now 4 days post-surgery and Mardi is doing great. She’s eating well, and acting much more like herself. It will be a couple of days before I breathe a final sigh of relief, but I’m very happy with how she’s doing. Even if she does look like Franken-sheltie. As far as Trip and her vague maybe-physical-maybe-mental problem, bloodwork was normal (again). I did a dental cleaning on her on Wednesday, to evaluate her broken tooth, and check for any other problems. The broken tooth was borderline as far as what treatment is warranted, and I’m undecided on what I want to do with it. Since the dentist was out of town and unable to consult, I just left it alone for now. She DID have a bad upper molar–gum recession and pain around this tooth. I pulled that one. I certainly hope that is the cause of all of her problems, but I have no way of knowing. Xrays of spine, hips, and knees, all looked good. She’s still on an agility break, and I’ll start doing some different stuff with her next week or the week after. We shall see how it goes.